A broken appliance can mean many things: burnt meals, trips to the laundromat, spoiled food. It can also mean compromised safety and property damage, as malfunctioning appliances are frequently the cause of fires, floods, and gas leaks. No matter how your malfunctioning appliance is affecting your life, the solution is the same: a phone call to the appliance repair experts at All Jersey Appliance Services . Our professionals are pleased to offer complete major appliance repair service, so we can get your dishwasher, fridge, or oven back in tip-top shape ASAP. Call now! Located in Paramus, we proudly provide Bergen County with refrigerator repair, washing machine repair, dishwasher repair, and more. Our team is committed to fulfilling your major appliance repair needs so you can enjoy the benefits that appliances are supposed to offer: reliable service, safe operation, and convenience. The team at All Jersey Appliance Services is proud to put its more than 10 years of experience to work for the people of Paramus, Wayne, Clifton, Mahwah, Englewood, and the surrounding communities. Our combination of field experience, training, and ongoing dedication to customer service ensures speedy service and quality results on each and every job. Whether we need to replace a motor or simply clean out a blockage from your dishwasher, our customers can expect the same commitment to quality. There is no task too large or small to perform if it means restoring your unit to flawless functionality. Unlike other appliance repair service providers who only perform larger jobs like dryer repair and washing machine repair, All Jersey Appliance Services services microwaves, ice makers, and garbage disposals. Although primarily focused on home appliance repair services, we are also available to work on residential units located in churches, law offices, and other commercial buildings. 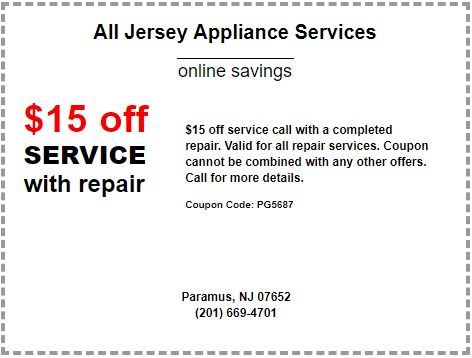 If you suspect that your appliance needs the attention of a professional, contact All Jersey Appliance Services today!